This carved wooden chest, called a Minnekästchen in German, held small treasured objects like jewels and toiletry articles. The decoration of these chests varies widely and includes chivalric, romantic, and allegorical scenes. 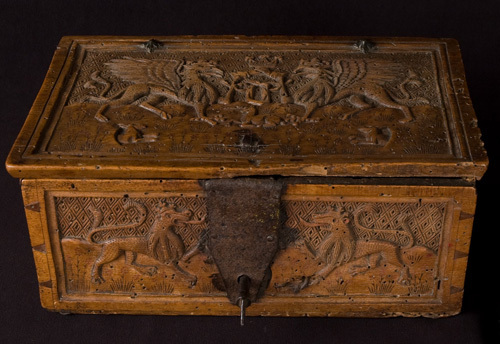 This marriage chest is richly illustrated with heraldic symbols and exotic and fantastical animals derived from medieval Christian bestiaries, collections of stories that describe and interpret the moral significance of real and imaginary animals. The lid shows two winged griffins who together crown a letter (an O, U or V) that probably refers to the uniting of a couple through marriage. A small unicorn, the symbol of chastity and courtly love, rests at the griffins' feet; two rabbits emerge from their burrows. Two crowned lions frame the lock on the front of the chest, and two chained unicorns adorn the back. A pair of camels-symbols of both prudence and lust-are on one side; on the other, monkeys or baboons are eating fruit.